The crown jewel of the University of California system, Berkeley is arguably one of the most selective public universities in the country. In 1999, it denied over 70 percent of its applicants. But the competition to get into the University of California's flagship campus wasn't always so steep. Before 1960, 15 percent of California's high school graduates were eligible to attend the school, and until 1964, the school admitted anyone who met its requirements. But competition increased after the 1960 adoption of the Master Plan for Higher Education in California, spearheaded by then president of the University of California system, Clark Kerr. In the late 1950s, California's population was growing by 500,000 people a year. Kerr foresaw massive growth in the state's higher education system, and convened a series of committees to draft a plan to deal with that growth. The members of the groups were weighted to favor the University of California's interests over those of the state colleges (which later became the California State University system), which Kerr saw as a threat to the university system's elite status. The result was a plan that almost entirely limited the state colleges from granting Ph.D degrees, thus setting up a two-tier educational system. The University of California schools would continue to be the main research institutions in the state, attracting better faculty and more qualified students, while the state colleges would provide the public service of a college education for anyone who wanted it. Most importantly, the plan tightened admissions requirements for the university system, admitting only the top 12.5 percent of the state's high school graduates. In 1964, at the peak of the civil rights movement, Berkeley instituted its Education Opportunity Program to bring in more students from disadvantaged minority groups. Under the master plan, the university could select up to two percent of its incoming freshman from the pool of applicants who did not meet its eligibility requirements. Though this loophole was probably added to the plan to allow the schools to stay athletically competitive, Berkeley partially used it to admit low-income and minority students that otherwise wouldn't have been accepted. In 1967--20 years after the Educational Testing Service opened its first west-coast office in Berkeley--the University of California began requiring all applicants to take the SAT, a move that further tightened eligibility requirements at Berkeley. Because of the gap between the test scores of white applicants and black and Latino applicants, this policy would obviously reduce the number of black and Latino students at the school. To compensate, the university doubled its exception to eligibility requirements, from two percent to four percent, for applicants "whose ethnic or economic background had disadvantaged them." Later, in 1979, the university raised that percentage to six percent. Throughout the 1970s, competition for admission at Berkeley gradually increased. By the early 80s, the school was denying nearly half of its applicants, and by the end of that decade, it was denying almost two thirds of those who applied. As the competition increased, so did complaints about the school's admissions process. 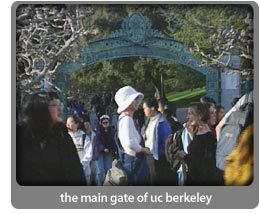 In November of 1988, the U.S. Department of Education's Office of Civil Rights announced that it was investigating admissions procedures at Berkeley after receiving complaints that the school was capping admissions of Asian students. As far back as the 60s, the Asian presence on campus had always been strong, and Asian admits rose dramatically throughout the 70s. But during the next decade, statistics showed a sharp drop in the percentage of Asian admissions, even though a higher percentage of these applicants met Berkeley's standards than those from other racial groups. Critics blamed the drop on the school's subjective admissions policies, which they said placed too much weight on extracurricular activities. In April of 1989, Berkeley Chancellor Ira Michael Heyman publicly apologized for the drop in Asian admissions at the school. Though he denied that policies had been put in place to deliberately restrict Asians, he vowed to make changes to correct the error. In May, the University announced changes to admissions standards that placed more emphasis on academic achievement, and agreed to make its admissions process public for the first time. In the freshman class of 1991, Asian students outnumbered whites for the first time in the school's history. Four years later, affirmative action programs at all University of California campuses came under fire. At the end of 1994, California Governor Pete Wilson told reporters he favored ending race- and gender-based preferences in government employment and college admissions. Weeks later, on January 19, 1995, University of California Board of Regents member Ward Connerly announced he would work to replace the university's affirmative action programs with "something� that is fair." Eventually Connerly and Wilson worked together to bring the issue before the entire board. The following year, California voters supported Wilson and Connerly on ending race based admissions. 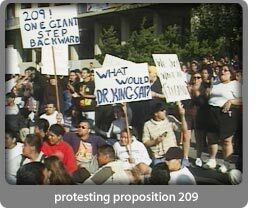 On November 5, 1996, 54 percent of the electorate voted 'yes' on Proposition 209--a ballot initiative banning all affirmative action in government employment and public education. The American Civil Liberties Union challenged 209, but the Ninth Circuit Court of Appeals upheld the law in April, 1997. The U.S. Supreme Court later declined to hear the ACLU's appeal. The ban on affirmative action had a drastic effect at Berkeley. In 1998, its first year without affirmative action in undergraduate admissions, the school admitted its least diverse freshman class in over 17 years, accepting 56 percent fewer African Americans and 49 percent fewer Latinos than in 1997. At the beginning of the Fall 1998 semester, Berkeley further refined it admissions process, switching entirely to a holistic approach of reviewing applications. In the previous year, the school admitted 50 percent of its students based on their test scores, grade point average and advanced placement credits, while admitting the other 50 percent based on a comprehensive review of the entire application. In 1999, admissions officers thoroughly reviewed all of the applications it received, taking into account essays and personal information as well as academics and test scores. After the change in admissions procedures, the number of black and Latino admits rose slightly.